Stroganoff is traditionally made with beef, and while I've never made the traditional recipe, I do make a casserole variation. 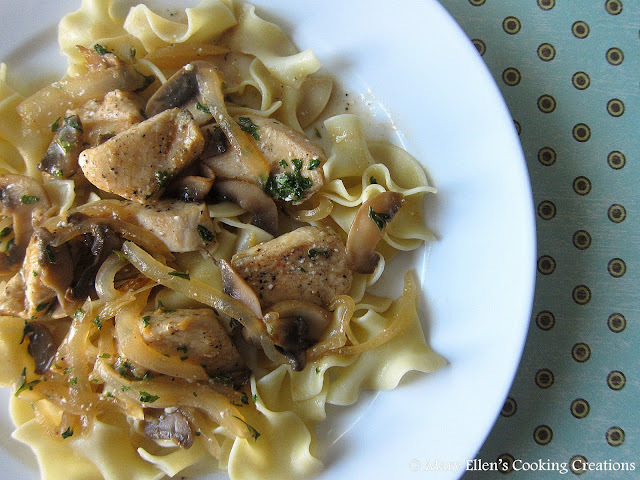 But then a few weeks ago I saw this recipe for Chicken Stroganoff on my friend's blog, A Taste of Home Cooking, and knew I wanted to try it. Now Jon isn't the biggest fan of chicken, but he has tried the 100+ chicken recipes I have in this blog. He has a few favorites, like my Spicy Garlic-Lime Chicken (he requests it whenever I ask him to help out with menu planning), but in general he wouldn't be upset if I didn't put chicken on a weekly menu. Then he met this recipe. We devoured it. Every last bite disappeared - sorry dad, no leftovers for lunch! It was THAT good! And wow, so quick and easy, too. Try this one!! Meanwhile, melt 2 tablespoons butter in a large skillet over medium-high heat. Add the onion and cook until slightly soft, about 2 minutes. Add the mushrooms and cook, stirring, until they begin to brown, about 2 minutes. Add the remaining 1 tablespoon butter, the chicken, flour, paprika, 1 teaspoon salt and 1/4 teaspoon pepper. Cook, stirring, until the chicken browns, about 3 minutes. Add the chicken broth and Worcestershire sauce and bring to a gentle simmer; cook until thickened, about 5 minutes. Stir in the sour cream and season with salt and pepper. Continue simmering gently until the chicken is cooked through, about 2 more minutes. Divide the noodles among plates. Top with the chicken mixture, parsley, some sour cream and paprika.